Over the past few decades, Marcia Hafif has built a body of work that includes writing, photography, sculpture, installations, and paintings. In 1972 Hafif came to a personal and process-based practice of working, beginning a series of monochrome works that explore the methods and materials of drawing and painting. At a period when the relevance of painting was in question, she concluded that the only way to proceed was to focus on, as she wrote in Artforum, “the materials and techniques with which art is made.” Hafif has questioned the discipline of painting by exploring and experimenting with types of paint (acrylic, oil, egg tempera, ink, watercolor, enamel) and supports (canvas, wood, paper, wall) for over four decades. During the 1960s and 1970s, critics began arguing that monochromatic paintings erased the artist’s hand from the work, but Hafif’s compositions work against that theory. Her paintings are filled with life, from the methodical brushstrokes and drips in her paintings to the visible differentiations in material. In this sense, Hafif’s practice lays claim to painting as a personal as well as conceptual process. 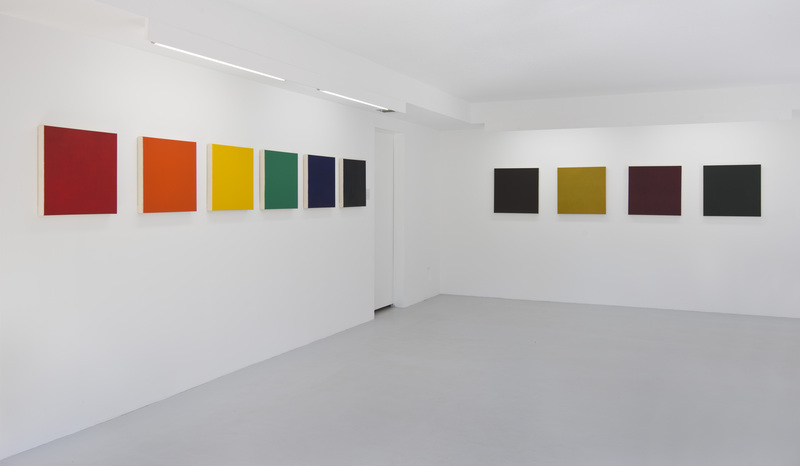 To date, the artist has produced more than 25 series, the most recent, Shade Paintings, is ongoing.